Following a premiere at the Tribeca Film Festival over the weekend, The Avengers director Joss Whedon, along with Kai Cole and their Bellwether Pictures banner, have decided to release their latest micro-budget feature film on VOD. After teaming on Whedon's contemporary adaptation of Much Ado About Nothing, this latest project is written and executive produced by Whedon and directed by Brin Hill (Ball Don't Lie). The film is called In Your Eyes, and the press release describes the film as "a timeless boy-meets-girl story, wrapped in a supernatural, Whedonesque world." Zoe Kazan, Michael Stahl-David and more star in the film and we have a sneak preview, along with the stylish teaser posters, and a message from Whedon. In the frozen East Coast winter, Rebecca (Zoe Kazan) is withering away in a life of cocktail parties and lonely nights as the sheltered, soft-spoken wife of a successful doctor. Across the country in sun-drenched, arid New Mexico, charismatic ex-con Dylan (Michael Stahl-David) is struggling to find his footing and a fresh start. When these polar opposites realize they share an inexplicable connection, a unique metaphysical romance begins. Nikki Reed, Mark Feuerstein, Jennifer Grey & Steve Howey also star in the film written by Joss Whedon (The Avengers, "Firefly") and directed by Brin Hill (Ball Don't Lie). 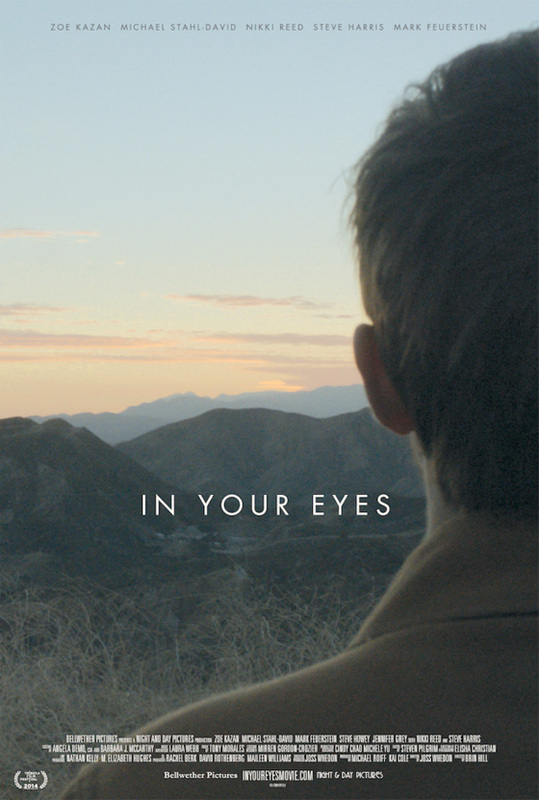 In Your Eyes premiered at the Tribeca Film Festival, but besides this short streaming debut, there's no official theatrical release date. Wow...what a powerful first scene. Definitely going to check this out and I'm glad that Whedon's new found fortune has allowed him to work on passion projects and pay it forward with younger film makers. In Your Eyes was written and produced by Joss Whedon in 2011. It is only being released now. Rebecca and Dylan share this psychic link (which has no supernatural components in my opinion). It is a soul-mate romance! Find someone you love and rent this movie! The Vimeo On Demand linkage with our iPad2, AirPlay, and AppleTV was flawless!